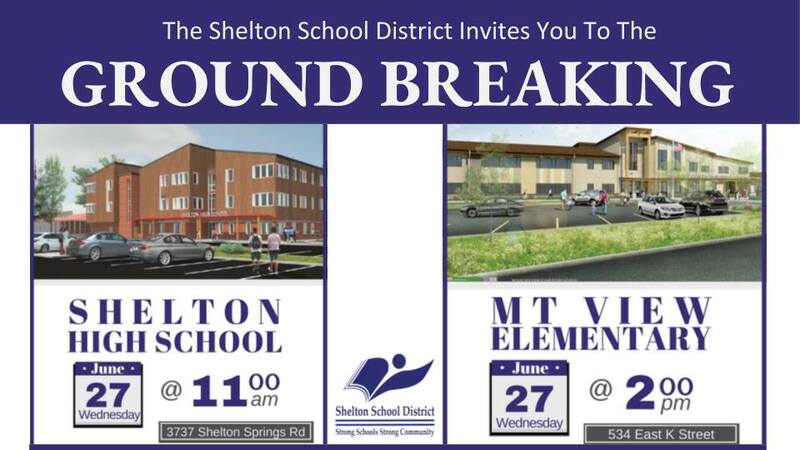 The Shelton School District is holding two groundbreaking ceremonies Wednesday to celebrate the construction of their new buildings. Students, families and the community are invited to attend the festivities at 11 AM at Shelton High School and 2 PM at Mt. View Elementary. For the 11 AM groundbreaking at Shelton High School, 3737 Shelton Springs Road, you are asked to park behind the Performing Arts Center at the High School as the student parking area is closed. The 2 PM groundbreaking at Mt View will take place behind the portables near the parking lot. If you are unable to attend, MasonWebTV Powered by HCC will provide live video streams of both ceremonies.